Having your clients’ name mentioned in the press can be a gift or a curse. Especially if said client has been involved in a crisis. As a publicist, one of your main roles is to safeguard the image and public perception of the brands you represent. One way to do this is through strategic media relations. For now, I’m going to skip the media relations tutorial and go straight to the moment when you’ve secured an interview for your client. Ask for a list of proposed questions. Getting questions upfront can help you prepare your client for the interview. The key word here is proposed as you must understand and let your client know that their responses can change the course of the interview at any point. However, advance questions can be used as a guide for how the interview will flow. Notify the reporter of restricted/sensitive topics. Make restricted topics a condition for granting the interview. If your client does not want to talk about certain issues you have to exercise your judgment and decide how to proceed. If it makes sense for them to stay mum on the issue, let the reporter know immediately. Hint: Never discuss restricted topics in email exchanges as your words can easily be reprinted and used as quotes in the story. The on/off the record issue is still pretty tricky so be careful. Research reporter’s interview style; last 3 (related) stories. If you’re working with a publication or reporter for the first time, do your research. Find out what types of stories they’ve written (yes that means actually read previous articles), and their interview style. If you’re dealing with a celebrity, it’s good to know if the reporter is someone who always goes for the low blow or if they like to avoid tough topics altogether. (Some reporters are notorious for their style of questioning, i.e. Oprah, Larry King, etc). Ask the right questions. Will this be a phone interview or on camera? If it’s a phoner, will you be using a recording device? What information would you like from us in advance? When can we expect the story to print? Can we review quotes in advance? These are just some of the questions you’ll want to ask before an interview. Asking the right questions can prevent media disasters from happening. If you’re unclear about something, just ask. Communication is key. Be there. Accompany your client on all of their media interviews (or send a colleague in your place). If you’re doing a phoner, use 3-way and listen (your mute button comes in handy for these). Redirect the conversation if necessary. If the reporter starts going into sensitive territory give your client a moment to recover, but be prepared to interject and move the conversation along. Or, if you are on a tight schedule don’t feel bad if you have to cut through the small talk to get the interview back on course. Redirecting is much harder to do if your client is on live TV, so make sure you have a good relationship with everyone involved so that it never gets to the point where you need to intervene. Back-up. If your client is hesitant about critical information offer to follow-up with the appropriate answer after the interview. Most reporters will oblige and move on to the next question. Critical information could be company financials, investments, etc. When in doubt, offer to follow-up because there is a huge difference between millions and billions. Take notes. Bring your own voice recorder or take notes. If your client is ever misquoted, you’ll have all the evidence you need to get a correction printed. Thank everyone involved. An industry vet once told me that I shouldn’t thank reporters after an interview because they’re just doing their job. I do not agree with that AT ALL. Saying please and thank you goes a long way in this business and being appreciative is never a bad thing. Always say thank you. Provide follow-up info. If your client promised the reporter additional information make sure you find out the reporter’s deadline and deliver all info in a timely manner. If you don’t, you give the reporter no choice but to run an unbalanced story or to kill the piece altogether due to lack of info. Make sure you deliver in this area. Review quotes. You won’t have an opportunity to do this often so take advantage of it when you do. Quotes are often modified to fit with the story so make sure everything is on point. Order reprints. Once the story runs, make sure you order reprints. 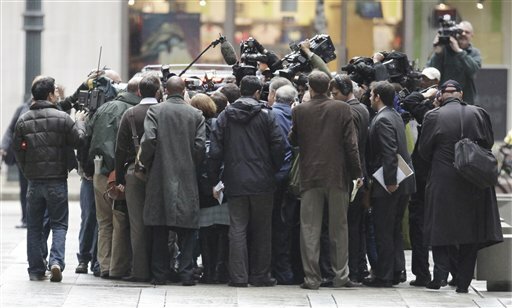 Have other methods for protecting your client in the media? Share them in the comments section!